While Sony’s EX series camcorders have received much (deserved) attention, don’t count Panasonic out. 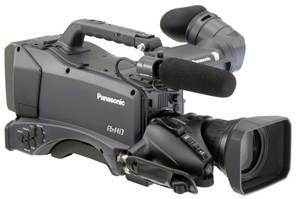 That’s the message from two observers of the production scene: Abel Cine Tech’s Andy Shipsides and Adam Wilt on his ProVideo Coalition blog both point to improvements in the Panasonic HPX370 camcorder’s optical block that make it—at less than $12k—a good, competitive deal. The camcorder’s official debut is at NAB this Sunday. While the newly developed ULT-type CMOS imagers are a modest 1/3-in.in diameter, their resolution, combined with reduced noise, higher sensitivity, and reduced skew, combine with the onboard AVC-Intra 100 codec to create a viable alternative to Sony’s offerings. Andy Shipsides has a video here that offers comparisons to Panasonic’s previous generation HPX300 camcorder, while Adam Wilt’s take can be found here. Panasonic’s own page on the HPX370 is here.